I would say Mestiza dress is one of the most wearable Philippine's national costumes. Sometimes people mentioned this as Imelda Marcos dress or terno since the former Philippine First Lady performed her duties in the past with this dress style almost all the time. First thing you will see on the dress is a distinctive butterfly sleeve. 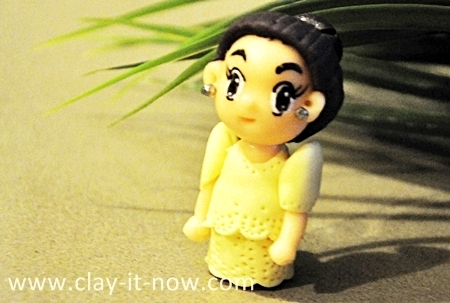 My clay mini figurine may not look gracious enough to represent the dress style but I do hope that you will have an idea about it if you have not heard about the dress before. And, It's my pleasure to share my creation with all my friends from Philippine. Hope you like it! Air dry clay in light yellow color, black, and skin color. You can make your own clay with my modeling clay recipes or buy the air dry polymer clay that will dry hard. Roll your skin color clay to a cone shape to about an inch and let it dry. Take your light yellow clay or other color as you like for the dress. Roll it to a pipe shape and flatten it with rolling pin to about half inch for the skirt. Be creative now and create the effect of the lace. I use clay needle tool to create lace pattern. The dress supposedly made of expensive lace and fabric with exquisite embroidery. Wrap the skirt around the body. Create the effect of the lace for the blouse too. You may start with pipe shape, flatten it to a rectangular shape, fold, open it and poke the middle of folding line for the collar, slot it in, cut the side of the dress if it is too big and secure the blouse with white glue. As for the sleeve, start with fat cone shape, flatten it a little bit, make a hollow and slot in the arm onto it. Attach both arms to the side of the body. Make the head complete with hair and facial feature to your liking with the same method with other mini figurines, start with a ball shape, make the mouth, nose and ears. And, draw the eyes and eyebrows with expression you like or just follow our figurine as a basic. Finally, attach the head to the body after it's dry completely. That's it!